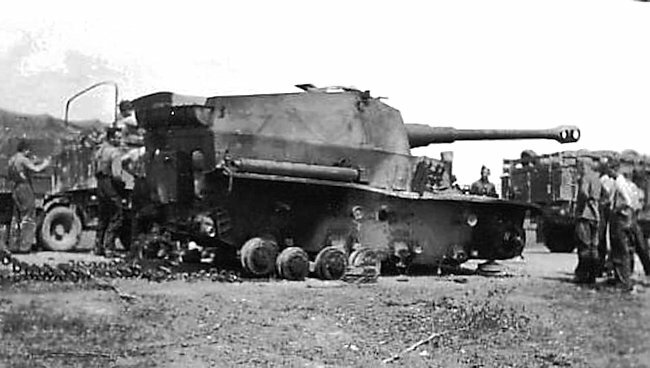 The German Army 10.5cm K18 auf Panzer-Selbstfahrlafette-IVa Dicker Max artillery self-propelled gun was intended to be used as a long range ‘bunker buster’. The purpose of this weapon to fire from a long distance at a strongly held enemy fortification without being in danger of coming under return fire from its target. The German armament manufacturer Krupp began development in 1939, but no prototypes were available in time for the invasion of France. The French Maginot Line system of concrete strongpoints, along the border between France and Germany, would have been one of its intended targets. With the quick surrender of France, there was no longer a requirement for such a weapon. It was then envisaged that this self-propelled artillery gun could be used in the role of a powerful long range tank destroyer. 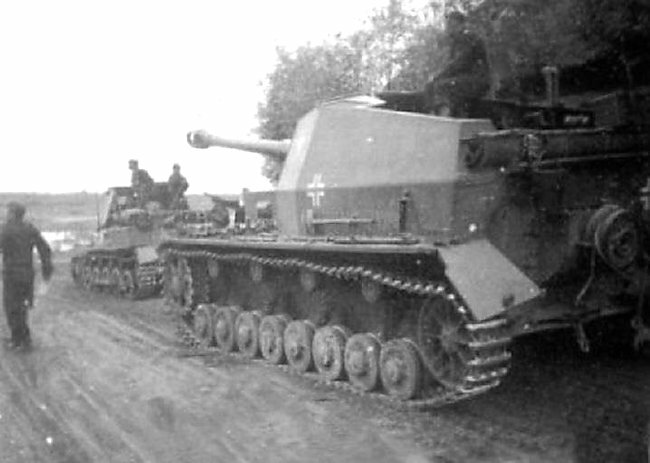 Two prototypes were built and sent to the Eastern front for battlefield trials. This self-propelled gun is normally known by its nickname, ‘Dicker Max’, which means ‘thick’ or ‘fat’ Max. 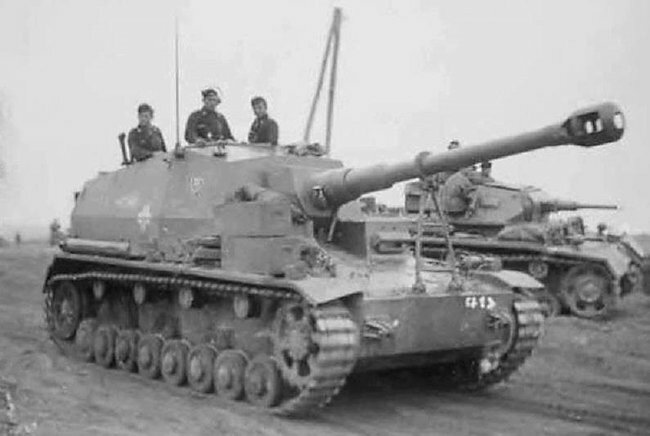 It did have a very large profile compared to other self-propelled guns built in 1941. It is also known by a number of other names. The long one is 10.5cm K 18 auf Panzer-Selbstfahrlafette-IVa or 10.5 cm K18 gepanzerte Selbstfahrlafette IVa. Throughout most of its development, it was known as the 10 cm K.(Pz.Sfl.IVa), but was redesignated 10.5 cm K (gp.Sfl.) on 13 August 1941. The letter K stands for the German word ‘Kanone’, which means gun or cannon. ‘Panzer-Selbstfahrlafette’ translates to armored self propelled gun mount. 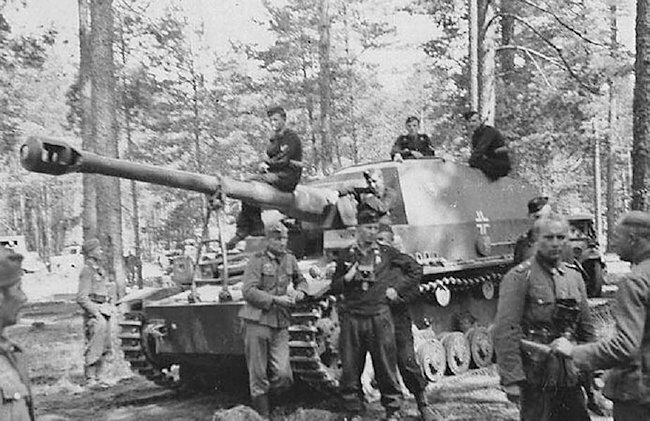 The Panzerjäger-Abteilung 521 unit commander, Oberleutnant Kurt Hildebrandt, mentioned in his war diary that this vehicle was given the name ‘Brummbär’. In January 1941, the two finished prototype Dicker Max SPGs were driven out of the factory doors. Hitler witnessed a demonstration of their abilities on 31st March 1941 and gave his approval. If combat trials were successful, then production could begin as soon as possible. Realistically, this would not have been possible until the spring of 1942 if the production order was given following successful trials. The K18 heavy field howitzer was a very large and heavy gun. The designers needed a strong vehicle to carry it. They chose the Panzer IV Ausf. D tank chassis, but it had to be heavily modified. The gun crew needed space to work the weapon. 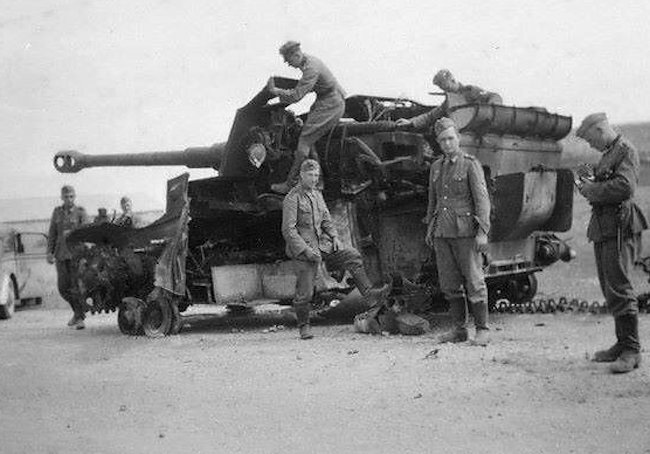 The Panzerkampfwagen IV engine was at the rear of the vehicle, but this was a problem. The solution the designers came up with was to move the engine to the middle of the chassis. The V-12 Maybach HL120 engine of the Panzer IV was replaced by a lighter Maybach HL 66 Pla 6-cylinder liquid-cooled engine. The tank turret was removed. The armored engine hatches were cut away to leave a large space in the rear of the vehicle. The gun was mounted above the engine. An open topped armored fighting compartment superstructure casement was built around the gun. The sides and rear were constructed using 20 millimetres (0.79 in) thick armor. This would stop most small arms fire and shell shrapnel. The crew were given better protection at the front. The forward glacis plate was 50 mm (2 inch) thick face-hardened armor. It was sloped at 15° from the vertical. This vehicle was seen as a second line support weapon that used its long range to engage enemy targets and stay out of harm’s way. It was not given a hull mounted machine gun. 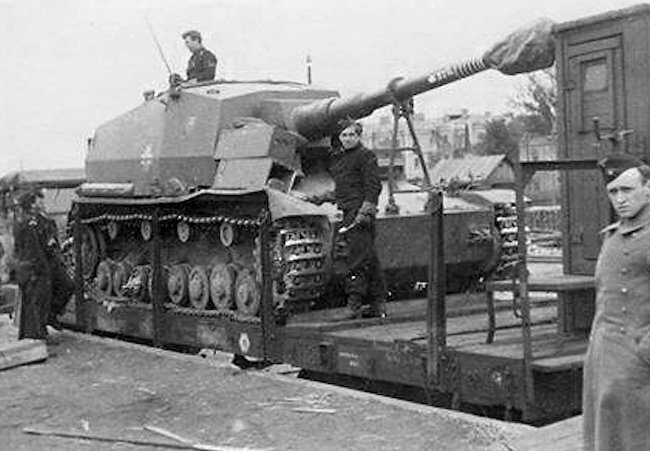 The one that was fitted to the Panzer IV tank chassis was removed. The designers thought it would be a good idea to replace it with a fake armored driver’s compartment on the right hand side of the vehicle, that matched the one on the left, to confuse the enemy. The crew carried three 9 mm machine pistols with 576 rounds of ammunition for use in self-defence. An ‘A’ frame gun travel lock was fitted on the front deck to secure the gun whilst the vehicle was driving across uneven ground. The 10.5cm K18 gun could only traverse 8° to the left and right, with a depression of 15° and elevation of 10°. The gunner and driver had to work together to bring the gun to bear on an enemy target. A large double baffle muzzle brake was fitted to the end of the barrel to help reduce the massive recoil of the gun by diverting the high pressure gasses sideways. This increased the time during which the gun barrel could be used before requiring replacement. There was storage space for only 25 rounds inside the fighting compartment. The German Army 10.5 cm schwere Kanone 18 (10.5 cm sK 18) was a field gun used by Germans in WW2. The German words ‘schwere Kanone’ mean heavy cannon or heavy gun. They were often abbreviated to ‘sK’ or just ‘K’. The 10.5cm K18 was heavier than the 10.5cm M18 field howitzer because guns have longer barrels than artillery howitzers. The 10.5cm K18 used the same Kupp gun carriage as the 15 cm howitzer because both weapons had a similar weight. It sometimes equipped the medium artillery battalion, but normally was used by independent artillery battalions and on coast defense duties. The gun was developed late in the 1920’s by Rheinmetall. It didn’t enter production until 1933. The most important feature of the 10.5cm K18 gun was the barrel. The barrel length was 5.46 m (18 ft), or L/52, meaning 52 times the caliber. This was almost twice as long as the 10.5cm Lfh18 howitzer, thus giving it almost twice the range: 19 km compared with 13 km when firing HE high explosive shells. Only 1,500 guns were produced. The APHE shell (Armor Piercing shells with High Explosive filler) weighed 15.6 kg and was fired at a velocity of 835m per second (2,739 ft/s). At a range of 2 km (1.24 mi), its armor piercing shell could penetrate 111 mm (4.37 in) of armor sloped at 30°. At 1.5 km (0.93 mi), it could penetrate 124 mm (4.8 in). At a range of 1 km (0.6 mi) it could penetrate 138 mm (5.43 in). At 500 m (0.3 mi) its AP shell could penetrate 155 mm (6.1 in) of armor. Production numbers of the 10cm K18 were quite low, especially when compared to the production of the lFH18 and the sFH18. Thirty five were produced in 1940, one hundred and eight were manufactured in 1941, one hundred and thirty five in 1942, four hundred and fifty four in in 1943 and seven hundred and one in 1944. In some official German Army reports the 10.5cm K18 gun was officially designated 10cm Kan. This can be very confusing. 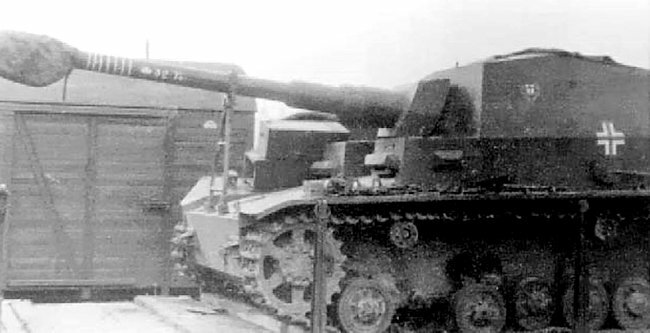 The actual caliber of the s.10 cm K18 was 105 mm (4.14 inches). The German 10 cm Kanonen originated from the WW1 10.5 cm naval gun caliber. When the 10.5cm sK 18 gun first entered service in the German Army, it was not motorized and had to be pulled by horses teams. But the gun weighed too much for one horse team of six horses, therefore the barrel and the carriage had to be towed as separate loads. Unlike the 10.5cm sFH 18 howitzer, however, the 10.5cm K 18 cannon was considered too large to be horse-drawn, and was therefore not found in the standard German infantry division until the divisional artillery regiments began retiring its horse drawn teams and using half tracked motorized tractor units in the middle of the war. 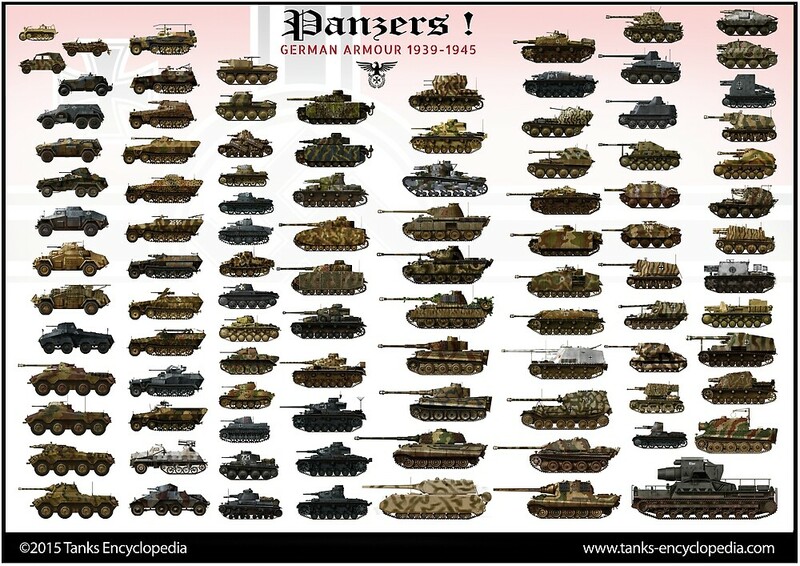 Panzer Artillery Regiments and later Panzergrenadier Divisions had been motorized from the outset, and one battery of the heavy battalion of these regiments was equipped with four K18 cannons for most of the war. The sK 18 was intended to be used mostly in counter-battery role; besides, due to its long range, it was more suitable to furnish fire support. The 10cm K 18 gun fired a flatter trajectory round at a higher velocity out to a range of 19,075-meters, making it the furthest-ranging gun in the German arsenal. A typical mission would be counter-battery fire (the destruction of enemy artillery). In the long run it proved a disappointment in service, due to its relatively low shot weight of only 5.43 kg, which reduced the effectiveness of the gun considerably. 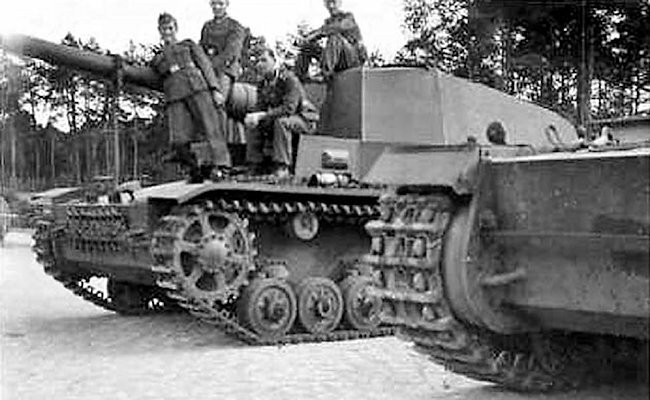 In May 1941, the Panzerjaeger-Abteilung 521 tank hunter battalion was chosen to conduct combat trials with the two new prototype 10.5cm K18 auf Panzer-Selbstfahrlafette-IVa Dicker Max self-propelled guns. They were used on the Eastern Front along with the two new prototype 12.8cm kan (Sfl.) self-propelled guns. The trials did not start well. 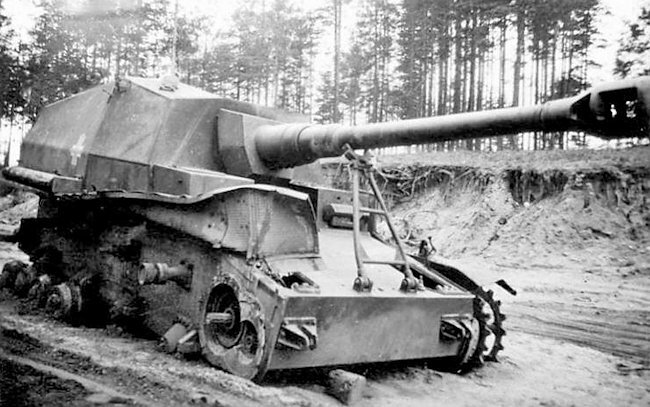 One of the 10.5cm K18 auf Panzer-Selbstfahrlafette-IVa Dicker Max self-propelled guns was completely destroyed when it accidentally caught fire and the heat caused the ammunition to detonate. The remaining 10.5 cm K (gp.Sfl.) 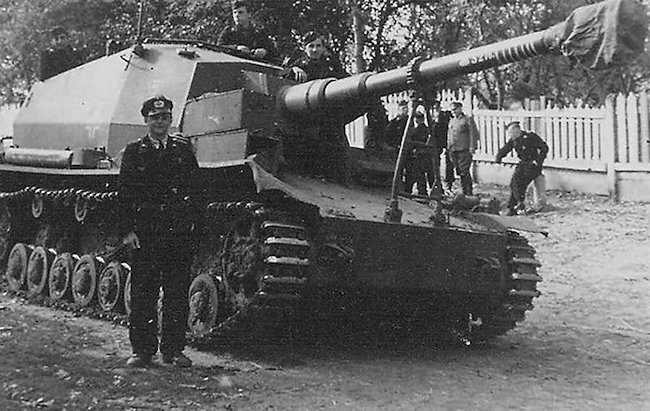 Dicker Max SPG fought successfully until the end of 1941. The gun barrel, in some of the black and white operational photographs, features white rings painted on it. These are ‘kill rings’, that denote how many Soviet tanks it had destroyed. Records show that it was transported back to Krupp and rebuilt during the first half of 1942. The photograph below is of the vehicle with damage. It looks like it has lost a bogie road wheel and suffered damage to the fourth road wheel, possibly caused by driving over a mine. It is on a railway flatback tank transporter wagon going to be repaired. This damage may have been caused by a mine. When the repair work was complete, it was returned to the Panzerjaeger-Abteilung 521 in time to take part in the 1942 new German summer offensive on the Eastern Front, called Case Blue. 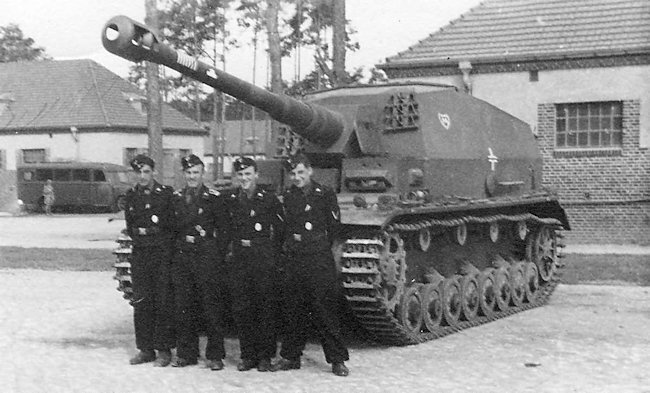 Battalion records of the Panzerjaeger-Abteilung 521 showed the 10.5 cm K (gp.Sfl.) Dicker Max SPG being available for Operation Case Blue. The same Battalion records for November—December 1942 do not show it on the register of available vehicles. Nothing is recorded of its fate. Normal if it was knocked out by enemy action or had a mechanical breakdown this would be recorded. One source has stated that the surviving Dicker Max was sent to Germany in October 1942 and rebuilt as a standard Panzer IV tank nicknmamed “Brummbaer”. Is this true? Why go through this effort when you have a weapon that is destroying enemy AFVs on the frontline. It seems unlikely. Were the trials a success? The one remaining vehicle is known to have combat kills but, by the end of 1942, production of the high velocity 8.8cm gun was at a higher level than the 10.5cm K18. 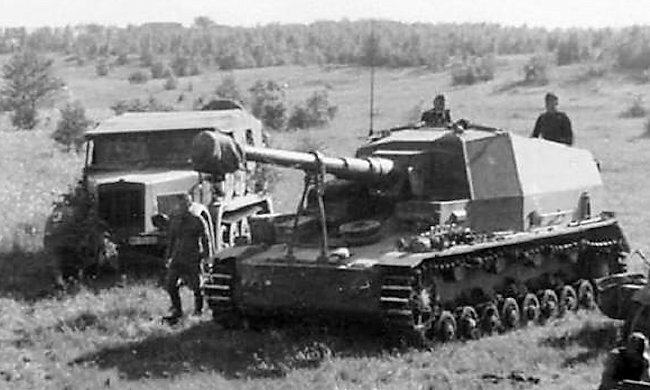 It may be argued that it was decided to concentrate on producing the anti-tank self-propelled gun that used the 8.8cm gun: these included the Nashorn, Jagdpanther and Ferdinand. On the 8th June 1942, the German Army tank hunter battalion Panzerjaeger-Abteilung 521 was fighting on the Eastern Front as part of XVII Corps, 6th Army, Army Group South. 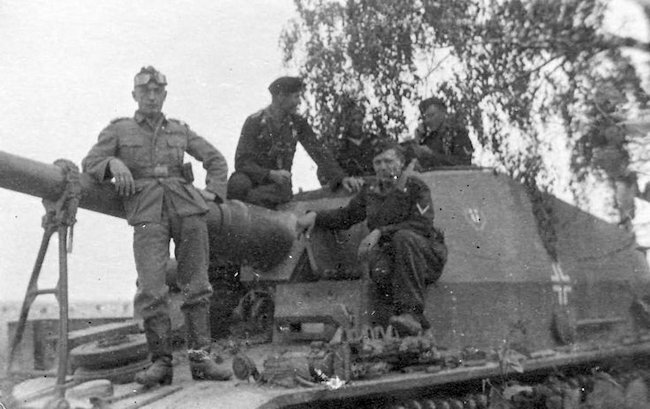 Battalion records recorded that it had two companies of Marder II 7.5cm Pak 40 anti-tank self-propelled guns, one company of Panzerjäger I 4.7cm anti-tank self-propelled guns, one platoon with two 12.8m Selbstfahrlafette auf VK30.01(H) Sturer Emil self-propelled guns and one self-propelled 105mm K 18 gun Dicker Max. The last surviving 10.5cm K 18 (gp.Sfl.) 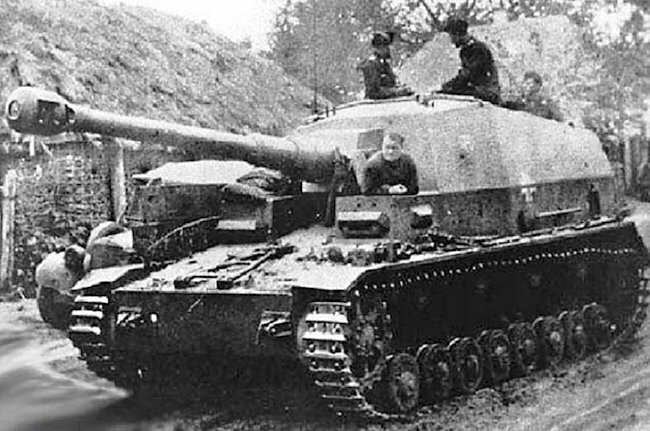 Dicker Max disappeared from the Panzerjaeger-Abteilung 521 ‘strength reports’ in November 1942. Both “Sturer Emils” and three Panzerjäger-I SPGs and a Marder SPG are shown available for deployment. 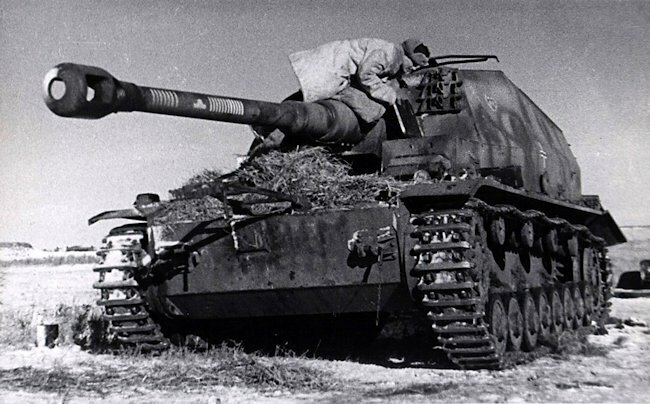 In December, only one “Sturer Emil”, three Panzerjäger-I SPGs and one Marder SPG were reported available for action when the unit was merged in a “Panzerjaeger-Verband”. It was destroyed in the Stalingrad-Area in January 1943. There is a problem to solve. The last known photograph of the surviving Dicker Max is dated February 1942 and has a solder dressed in what looks like Red Army winter clothing climbing on top of the vehicle. It is not known if this is a Soviet soldier or a German soldier wearing captured winter clothing. It is not known what happened to the 2nd Dicker Max. The 10.5cm K 18 auf Panzer-Selbstfahrlafette-IVa Dicker Max self-propelled gun. This vehicle caught fire in an accident which ignited the ammunition and destroyed it before reaching the front line. 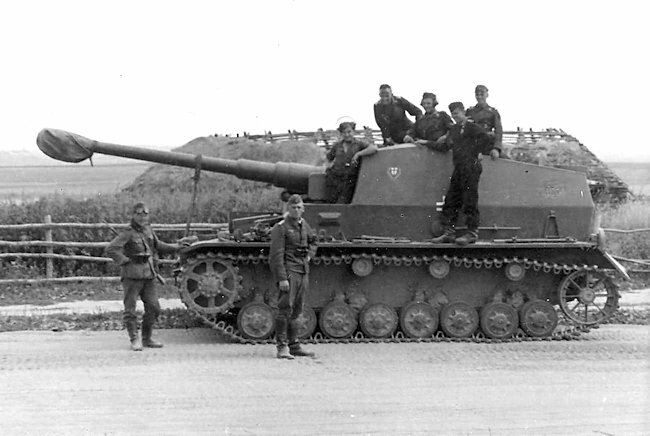 The Panzerjaeger-Abteilung 521 tank hunter battalion on the Eastern Front received the only surviving 10.5cm K 18 auf Panzer-Selbstfahrlafette-IVa Dicker Max self-propelled gun for combat trials in May 1941. The crew called it ‘Brummbaer’. Excellent cite. Enjoy using it. Keep up the good work. Any idea what colour was painted over the grey in the last photo? Is the sturer emil on here? Just curious, the Dicker Max looked almost exactly like a mini version of it. Not yet, but an article on it is currently in writing. The article states that the Dicker Max was used in the attack on Gibraltar! Surely you mean Sevastapol (Case Blue)?